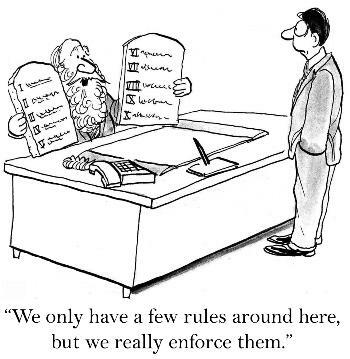 If you’ve ever worked for a company with established policies and procedures, you understand the concept of playing by the corporate rules and hidden commandments. These policies, procedures and unwritten rules are developed over time based on situations that come up in the normal course of business. Smart leaders know that if something frequently goes wrong at a particular point in the process, they need to change a policy or procedure to help ensure that the process flows better in the future. You can apply the same principle to your own life. In fact, you’ve already done so many times without thinking of it in these terms. As your personal life circumstances change, you make adjustments. And sometimes other people mold you to their ways, especially if you live or work with them. “I don’t eat bread,” says a celiac who knows it will make him sick. “I always choose ground travel,” says the person who fears flying. “I don’t eat meat,” says a vegetarian who feels more energetic when she avoids it. “I can’t work until the kids start school,” says the mom who wants to stay at home with her children. “I always wake up early,” says the person who works the early shift. These are verbal declarations of informal policies that help you manage your life and keep it running as smoothly as possible. These policies give you a sense of control over your health, relationships and even your fears. Once you become conscious of your own personal rules or policies, you’ll start to notice them in others as well. Policies and procedures work together. If you decide to change one of the rules you live by, it’s likely to affect one or more of your procedures. If you’ve ever tried to change one of your rules, you may find it difficult to do so because you’re habitually conditioned to carry out procedures that support your unwritten policies. If you know someone who has tried to quit smoking (incorporate a new life rule/policy), they’ll often say it’s hardest at specific times during the day (their normal procedures). Smokers take breaks together, have lunch together and have mini-processes in place to support their habit: purchasing cigarettes, stocking up to make sure they have enough with them for the day, bringing the right kind of outerwear to smoke outdoors and so on. Not only do they have to overcome the physical addiction, they also have to change their processes and possibly even face resistance from friends. You have a series of mini-procedures you repeat on a regular basis. You may have a certain way of preparing your breakfast, getting ready for work, doing various tasks at work, doing the laundry, or relaxing in the evening. Once you’ve fully adopted a procedure, you tend to go into “auto” mode. The good thing about this is that it allows you to effectively use your time. When you’re in “auto” mode, you can multitask by thinking or doing other things at the same time. It’s the same concept that people use to drive while talking on the phone or work while watching TV. The not-so-good part about going into “auto” mode is that you can fall into repeating a procedure day after day even if it no longer serves you well. You start to do things automatically without considering whether or not you should continue doing the same things over and over again week after week. If you’re happy with your life just as it is, keep doing what you’re doing. Chances are you’ll get the same results until circumstances change, and eventually they will. Just as there are no bad habits, there are no bad policies or procedures. They’re all effective in producing similar results as long as you’re somewhat consistent with them. Once you have this new awareness, you’re better positioned to evaluate which of your policies or procedures you want to modify. When is a good time to begin making these adjustments? The best time is now! By now your inner voice is probably speaking to you . . . telling you what you need to change. What personal policy do you need to change? What procedure needs some editing? This might be the natural remedy you’ve been searching for. When you need some strength to work through adjustments, focus on the benefits you’ll gain after you make the change. Once you make a change, please come back and share your story. If you’re not ready to edit your own life yet, begin by helping others who are eager to change.